First person shooters are a dime a dozen. Especially in North America – this genre of gaming is completely flooded and for the most part, each new game brings a slight twist but nothing more. But every once in a while a game comes along and changes all of that. While The Darkness is not entirely unique by any means, it manages to do just enough to really stand out in the crowd. At the same time, the familiarity that I feel while playing this game gives me a warm and tingly feeling deep down. The studio that developed The Darkness (Starbreeze) released a game back in 2004 based on the Riddick movie series – The Chronicles of Riddick: Escape From Butcher Bay. But unlike the movies, it was an incredible experience and to this day, remains one of my favourite games. I was ridiculously excited when I heard that a remake was in the works, but even more so when I found out that Starbreeze was the studio behind The Darkness. If you played Riddick, you will definitely see similarities. You play as Jackie Estacado, a New York mob hitman who finds himself in a whole lot of trouble on his 21st birthday. Jackie’s voice was immediately familiar to me as the dude that voiced him played Nicky in The Black Donnellys – an amazing series that was canceled only a handful of episodes into the first season. A lot of the story is narrated by Jackie in the form of mini cut-scenes that cover up loading screens, which is quite a nice touch. But Jackie is only one of the great characters that make up the cast of The Darkness. There are allies and enemies through-out the game, along with civilians that you can choose to interact with and who provide you with side quests. Some of these characters are just great, though! The voice acting is stellar and the characters look, act and speak very realistically. But obviously, there’s a lot more to The Darkness that make it an amazing experience. Jackie’s movements and fighting style will take some getting used to. He moves very slow in comparison to the majority of shooters and relies more on his powers than his guns. Through-out the game, you acquire various Darkness powers that are all quite useful and make things a lot easier when it comes to disposing of the baddies. You also have Darklings (minions) you can call on to lend a hand. Like your Darkness power, there are 4 Darklings and each has a unique ability. I rented this game on Tuesday and have nearly completed it already on normal difficulty. I could have finished it off tonight, but I want to drag it out a bit more. That’s not to say it’s abnormally short – I put in quite a few hours over the past couple of days. I think by the time I’m done with it, it will feel just right. Even though I’ll have finished it by the time I return it, I’ll definitely be buying it. 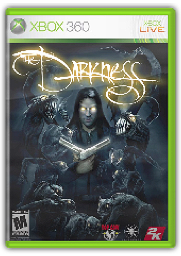 The Darkness is one of those games you always want to have on hand. And I’m certain the ending is going to be mind-blowingly-brilliant, as was the closing sequence in Riddick.